Over the last two years the neutrals of choice have shifted from the brown and beige spectrum to the grays and blacks. Gray tones are hot right now in both interior design and in fashion. 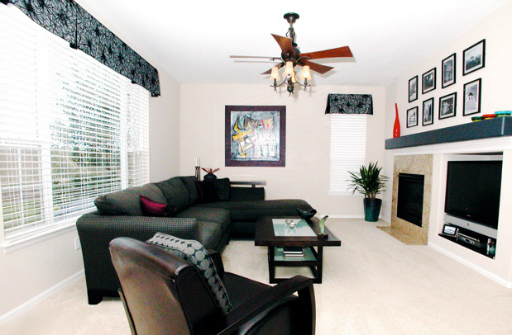 If you will be renovating soon, it’s a great time to incorporate more grays and blacks into you home. But what if you completed a remodel or new decorating scheme just a few years ago? Are you worried that your brown-based interiors will look dated? I know that a few of my clients felt that worry, so I imagine you do too. I’ve worked with them on stunning solutions and I want to share those with you. The good news is that we are talking about neutrals and no neutral is ever “out of style”. Neutrals are classic, timeless and always a good bet for major pieces in your home. They make a great base on which to add color and have longevity. However, if you find yourself working with a very brown and beige base, I have some tips to help you incorporate grays and blacks and blend it all together for a timeless, balanced and livable interior. 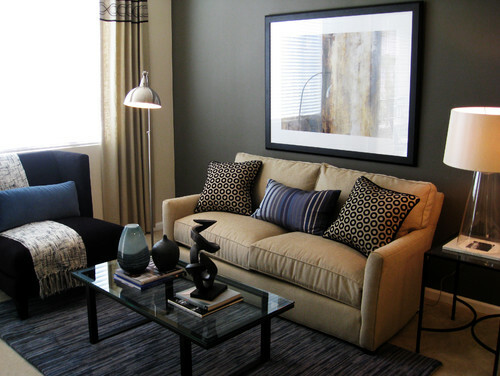 This room is a fabulous blend of tan and gray, with touches of black and blue. Perhaps you find yourself with a tan sofa. Paint an accent wall behind it in a striking charcoal gray to really make the sofa contrast against the wall and give the room an update. While this room is primarily neutral, because it is pulling from both the brown spectrum and black spectrum, it is a more dynamic neutral palette. The bold pillow fabrics add a little something extra. Here we see the same concept: gray walls behind a tan sofa, with a tan jute rug. 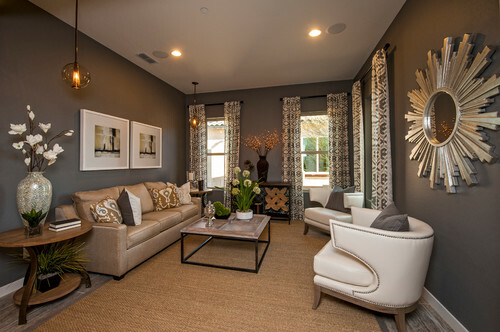 However, this room also incorporates lovely fabrics that blend the grays and tans. These fabrics, in the drapery and pillows, bring the room and colors together elegantly and seemlessly. If an accent wall or gray walls won’t work in your home, there are still plenty of opportunities to add gray to your beige sofa. One easy tip – add gray accents. In the room below we see gray throw pillows, throw and dining chairs. To punch it up a notch, orange pillows add a little spice. This particular view doesn’t show art or window treatments, but that would be another opportunity to add both the gray and orange for a complete, balanced design scheme. The interior designer of this room has taken a more combined approach. The furniture pieces are a combination of both grays and beiges. It works so well because the furniture fabrics are in the same tone – not mixing light and dark colors, but an even balance through all pieces. The green accents help to pull the various pieces together in harmony. The warm gray walls and area rug serve as appropriate backdrops, complimenting the combination. I actually did several of these tips in my home that we moved from about 4 months ago. I have, admittedly, always favored the black and gray side of them spectrum. However, when we bought that home in 2007 (built in 2005), browns were the hot ticket and the home came with primarily browns, and beiges. Using the base of beige carpet and sandy-hued walls, as well as travertine tiles around the fireplace, I added contrasting gray paint to the mantel. I mixed in a sofa with 2 tones of gray in the fabric and black and gray valances. Now that I had established a neutral base, bright colors were added to compliment the artwork – a colorful cow on a (you guessed it) gray base. Finally, incorporating both browns/beiges and blacks/grays can be done in the more permanently designed areas of you home, not just furniture and decoration. This bathroom design features a soothing balance of gray and tan. It’s earthy and spa-like. It works so well because there are multiple uses of each color. We see gray in the floor tiles and again on the painted walls. Tan was used on the wall tiles, countertop and again on the woven roman shades. The repetition of colors creates a harmony and balance in the space. Below is a kitchen remodel completed by Beautiful Habitat in which we mixed browns and blacks for a timeless interior design. The rest of the house is in browns and tans. We purposefully added black to this kitchen update to blend with the house, yet pull in the black. The granite is a beautiful black and brown combination. We mixed black glass tiles and travertine in a custom backsplash design, made more interesting in the vertical installation. How have you mixed browns and blacks in your interior?